"Vin Diesel, Paul Walker and Dwayne Johnson lead the returning cast of all-stars as the global blockbuster franchise built on speed races to its next continent in Fast & Furious 6. 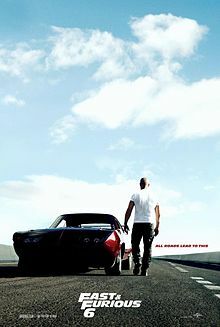 Reuniting for their most high-stakes adventure yet, fan favorites Jordana Brewster, Michelle Rodriguez, Tyrese Gibson, Sung Kang, Gal Gadot, Chris "Ludacris" Bridges and Elsa Pataky are joined by badass series newcomers Luke Evans and Gina Carano. Building on the worldwide blockbuster success of Fast Five and taking the action, stunts and narrative to even greater heights, Fast & Furious 6 sees director Justin Lin back behind the camera for the fourth time. He is supported by longtime producers Neal H. Moritz and Vin Diesel, who welcome producer Clayton Townsend back to the series." FAST & FURIOUS SIX/FAST SIX comes out May 24th, 2013. It is directed by Justin Lin, it stars Vin Diesel, Paul Walker, Dwayne Johnson, Ludacris, Luke Evans and Gina Carrano.